I am eternally grateful to two former college roommates who introduced me to the best of Korean food. 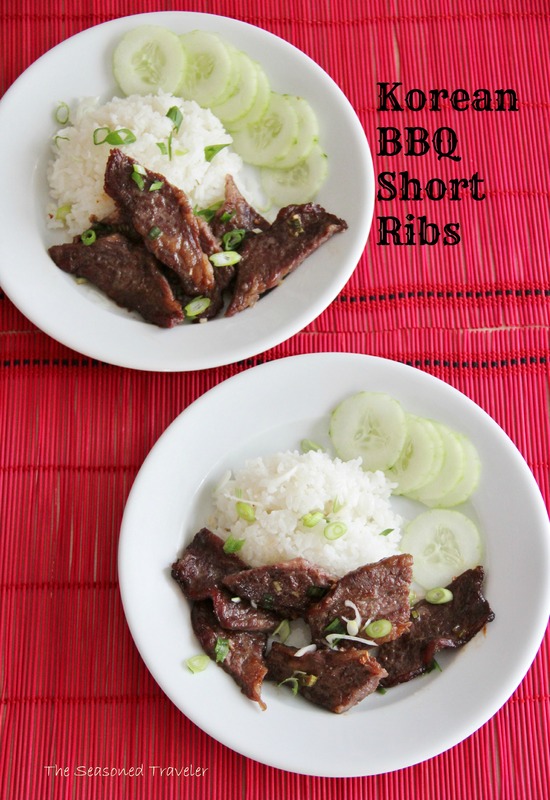 There’s nothing like the sweet-salty marinade of kalbi (or galbi), Korean BBQ short ribs. These are great on the grill, but this time I tried baking & broiling them and they were just as delicious. You can serve them up with white sticky rice and a sprinkling of green onions, or tucked inside lettuce wraps. Enjoy! Gently rinse the ribs and/or wipe with paper towels to make sure there are no loose pieces of bone. In a large bowl, stir together the soy sauce, brown sugar, water, garlic, two of the chopped green onions, and sesame oil until the sugar has dissolved. Combine the ribs and marinade in a large plastic zipper bag, squeeze out all the air, and refrigerate the bag for 3 hours to overnight. If baking & broiling, preheat the oven to 375 F/ 190 C and line two baking sheets with foil. Shake the excess marinade off the ribs and place them flat on the foil in a single layer. Discard the marinade. Bake until caramelized around the edges and cooked through, about 20 minutes, then put under the broiler to crisp for 5 minutes. If grilling, preheat an outdoor grill for medium-high heat, and lightly oil the grate. Remove the ribs from the bag, shake off the excess marinade, and discard the marinade. Grill the ribs on the preheated grill until cooked through, 5 to 7 minutes per side. Use kitchen shears to cut the meat off the bone and into smaller pieces. 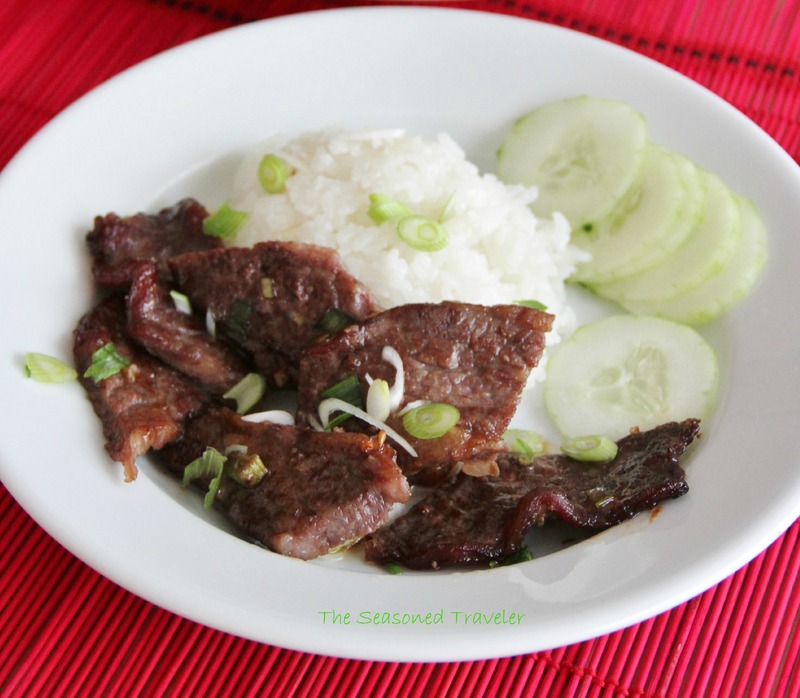 Serve with white sticky rice and more chopped green onion, and/or tuck inside lettuce wraps. A marinade that could be used on other meats as well, I would imagine. Nice. Thanks, I enjoy that sweet and intense marinade with the tender beef; glad you like the sound of it! I love this! I use to cook for Koreans onboard, long time ago. Now, when I see Korean foods all I think is a nice Kimchi with it! Thanks for bringing this one to the Fiesta Friday Party! Oh yes, it would be great with a variety of sides, especially a nice kimchi with it 🙂 Thanks! Love the marinade, and I love Korean food. Wonderful recipe. Thanks! My mouth waters just thinking about Korean food. My freshman year in college, my roommate’s mom used to bring us loads of homemade Korean food, and we’d savor every bite. Kimchi, bulgogi, kalbi, yum! Thanks for this! My husband loved Korean BBQ. I will make a few adjustments for my dietary needs but I we be making this!! Looks delish! Awesome, I hope you & your husband enjoy your Korean BBQ. Thanks! The marinade looks good, I could try that on chicken couldn’t i? Thanks, Elaine. I’ve never tried it on chicken and imagine the marinade as is would be too sweet for it; I’d recommend cutting back on the brown sugar by a lot and it might be close to a teriyaki. I’d love to hear how it goes if you give it a try with chicken! I love Korean food, I always feel like eating it! Your plate looks scrumptious and your photos are stunning! I’m so glad you’ve decided to bring it to FF, thanks a lot! Mmm…your ribs look perfect, Laura! Sometimes we broil ours in the oven as well! what lovely clicks 🙂 can this marinade be used for mutton or chicken ?? Thanks! You know, I’ve never tried this marinade on mutton or chicken, so I can’t say how it would work. I’d recommend reducing the brown sugar as the sweetness might overpower other meats. Didn’t use the marinade yet, but the directions alone worked perfectly and the only solid recipe I’ve found that cooks the meat perfectly every time. Can’t tell you how many times I’ve come back to this same recipe for the times and temperatures lol. THANK YOU! This was easy and delicious. I used the marinade, heated until safe , used a slurry to thicken and dipped my ribs before serving. They got rave reviews! Thanks so much. I have pics if you want to see.